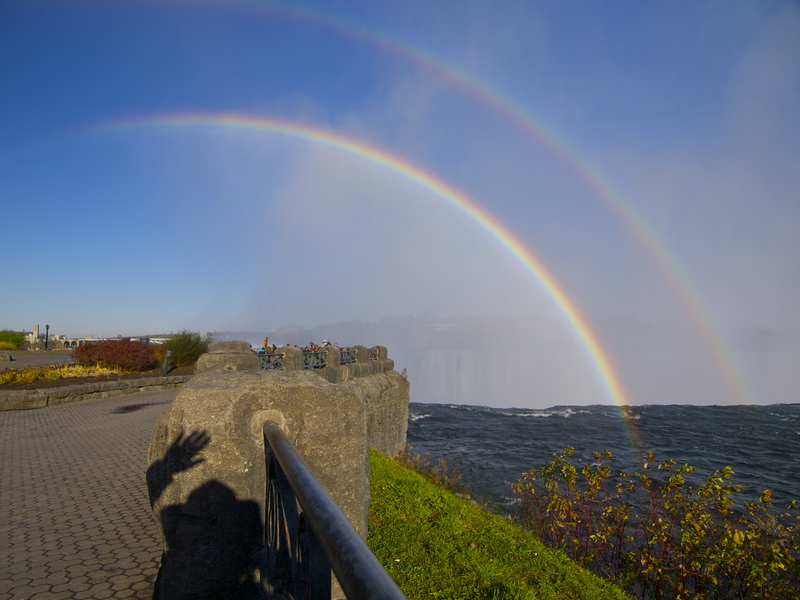 Visiting Niagara Falls for the first time was kind of like my first trip to the Grand Canyon: I knew it was going to be awesome – I had seen tons of photos and heard great things –but I didn’t want to overplay my mental picture and be disappointed in the real thing. Driving up to the falls on the Canadian side I told myself: “It might not be that big. Don’t get your hopes up. 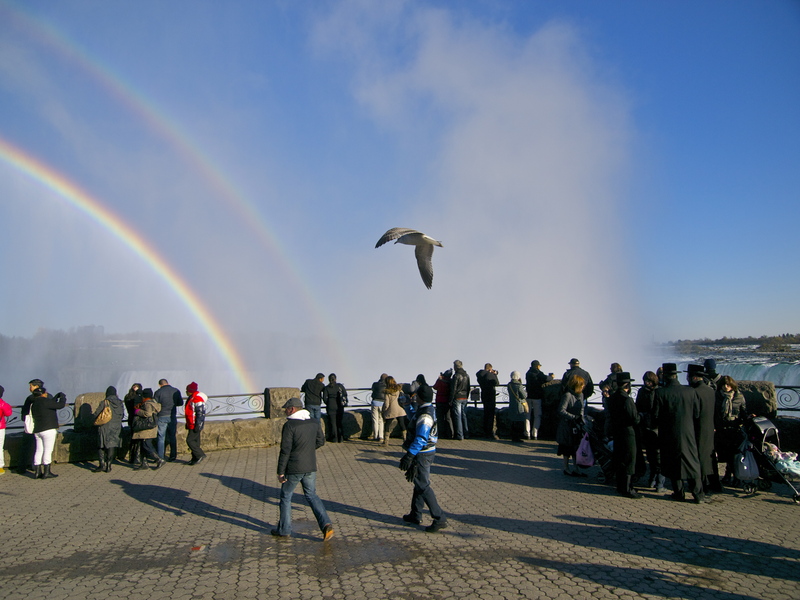 You don’t want to be let down.” And then BOOM: Niagara – one of the most powerful forces on Earth – framed by double rainbows. My first reaction was the same as my first reaction to seeing the Grand Canyon: whoa. Some places are grander than any photo or any mental picture. Danger! No kidding. I have seldom stood so close to a force so disconcertingly dangerous. Watching the Falls-watchers. 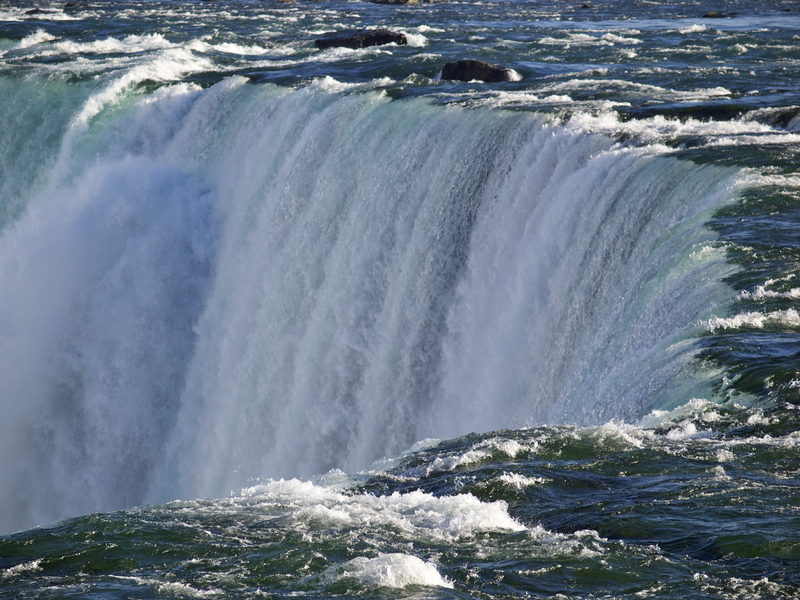 Mid-November is a great time to visit the falls. 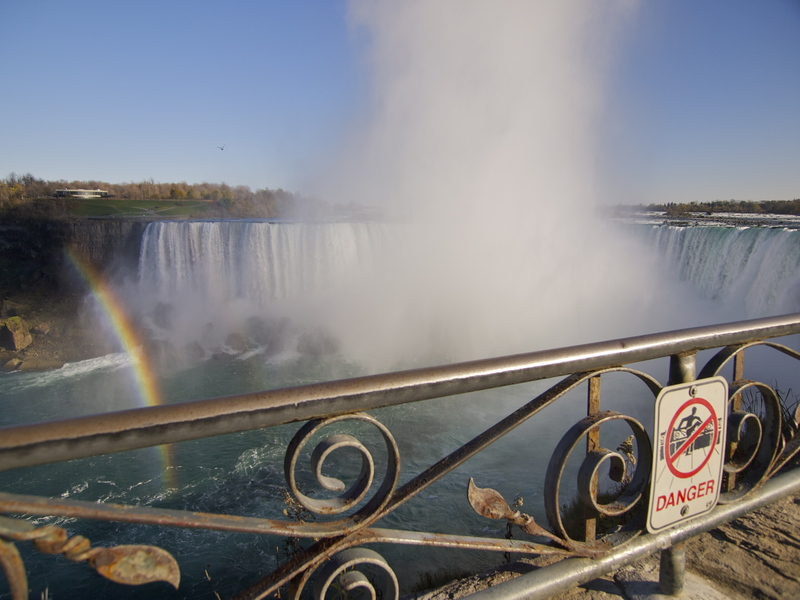 All the ticketed attractions like Maid of the Mist have closed for the winter, which cuts down on the crowds a lot. 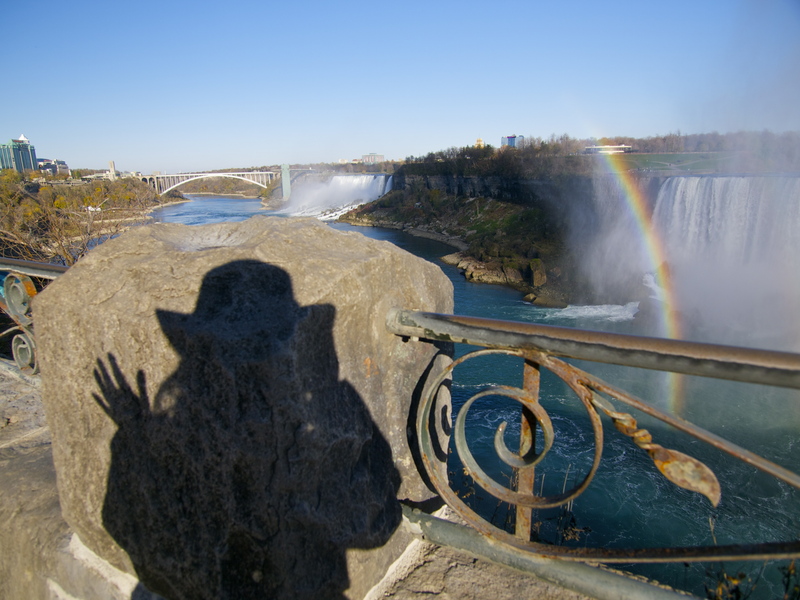 Niagara Falls Self Portrait. I wasn’t about to stick my feet over the edge to get one of my shoe shots! 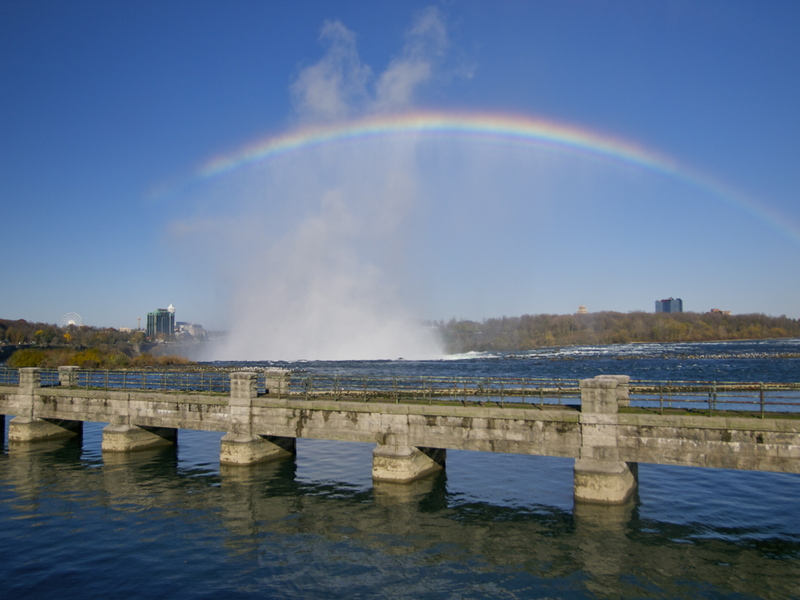 Nearly a full rainbow over the Canadian side of the falls. The border agents let me into Canada and back into the US with no problem. Once again, nobody even asked about the dogs! I’m working on a series of these viewfinders at different overlooks. I love how much they look like faces! Fall colors on Goat Island. 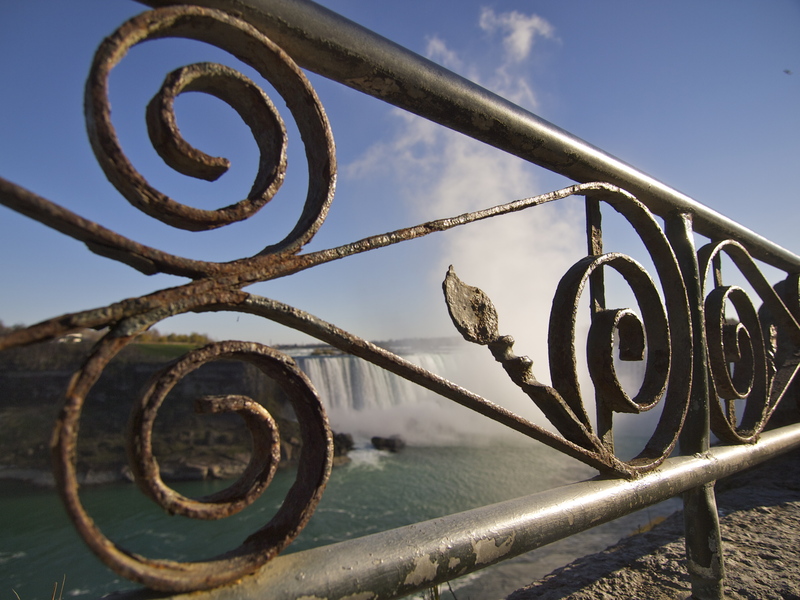 The American railing isn’t nearly as lovely as the Canadian railing. 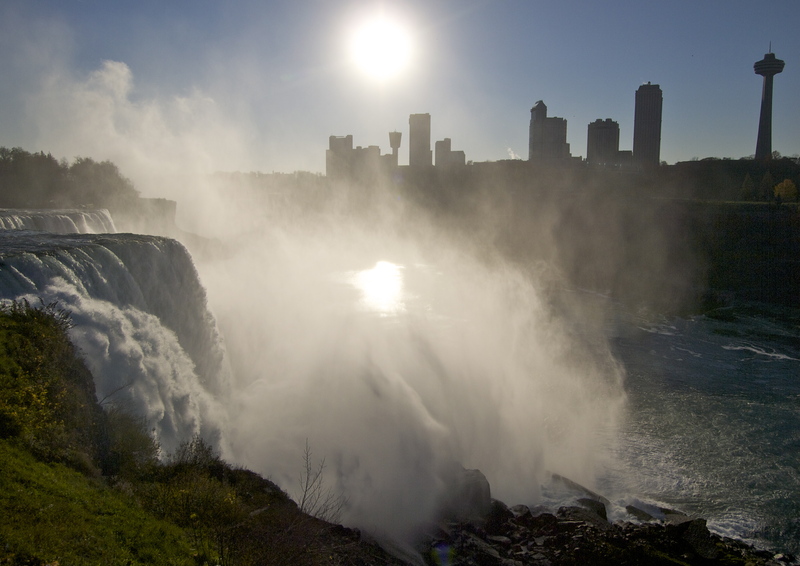 This entry was posted in Beyond the USA, Photography, Road tripping!, Uncategorized and tagged Niagara Falls. Bookmark the permalink. Spectacular photos of a spectacular place. I will keep the November visit tip in mind. 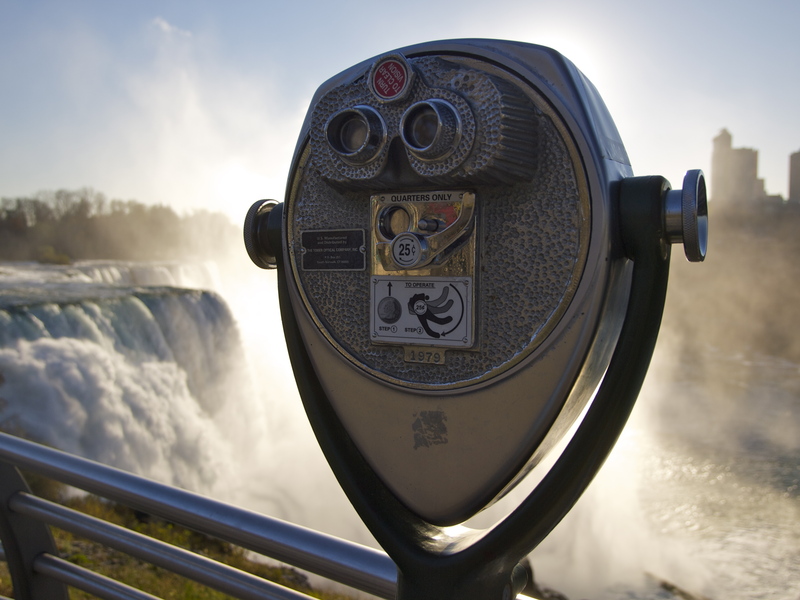 The viewfinders do look like faces–makes you wonder who is doing the looking. Fantastic post. I’ve visited twice myself. Don’t you think it is slightly ruined by the street around the corner with all the amusements and fast food joints – it’s like visiting two completely different worlds – Grand Canyon vs Vegas on a smaller scale! Thanks Sian! I didn’t go to the street around the corner – I didn’t even know it was there – so it couldn’t ruin the place for me! I stuck to the riverside and walked several miles up and down the rapids. Away from the brink itself I saw very few people. 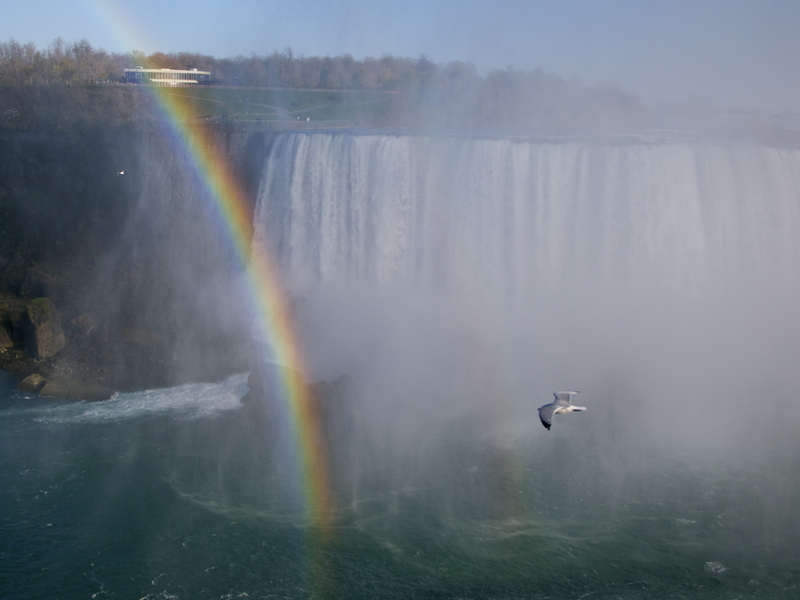 I’m just glad the whole experience was free, aside from the $3.25 toll I had to pay to cross the Rainbow Bridge into Canada. Next time, I’ll walk across! WOW ! What a wonderful experience,I love waterfalls and this one I have always wanted to see. Thanks for the spectacular photo’s. So many wonderful rainbows. You are truly blessed. Yes, I certainly felt blessed! 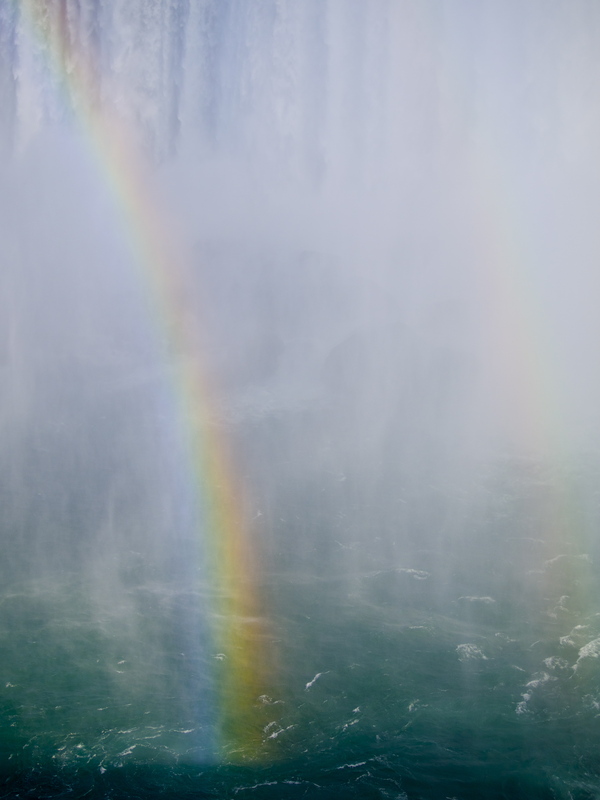 I think rainbows occur frequently at the falls (one of its nicknames is the “Rainbow Maker”. but still, pretty awesome to be greeted by two! You captured the Falls beautifully. They are quite amazing, aren’t they? The power of the water is mind-blowing. Imagine as an early explorer coming upon them. 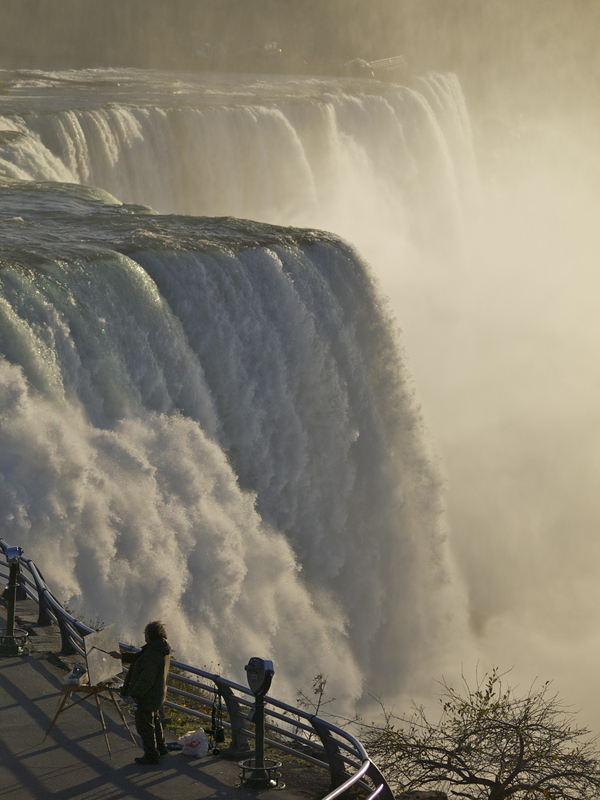 I live about 15 minutes from Niagara Falls on the Canadian side and they are definitely an incredible sight to behold. Spring is a great time to visit as well once the Spring flowers start to bloom. 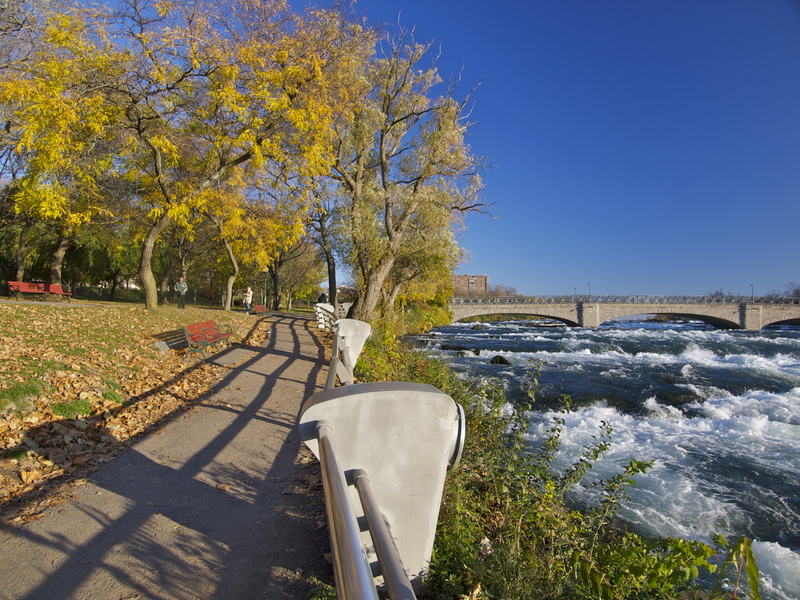 If you take a leisurely drive down the Niagara Parkway you will see the Niagara Parks gardens as well as the Butterfly Conservatory. A little further along the Parkway is the Brock Monument and the sight of the Battle of 1812. They are definitely worth the trip.